Last Sunday Andrew Merpaw and I walked around downtown and shot everywhere from Bastion Square to Chinatown’s Fan Tan Alley. 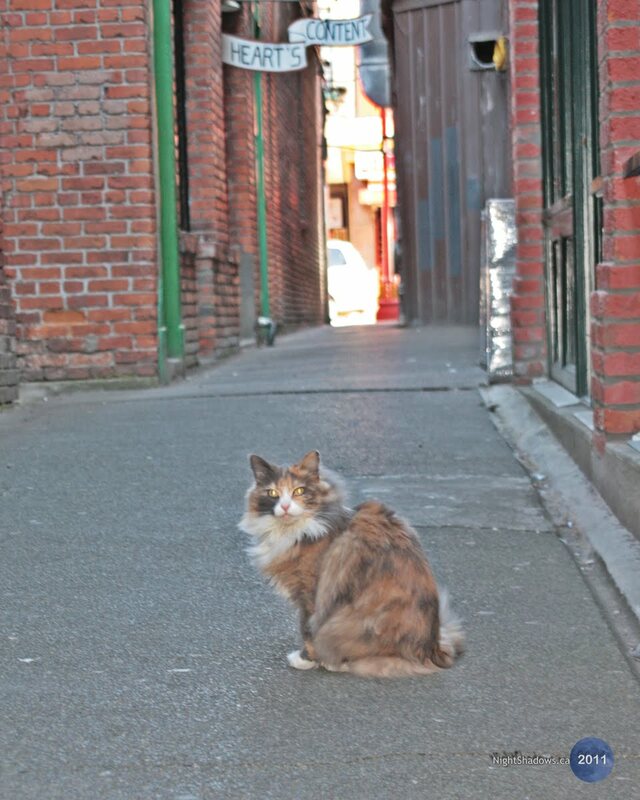 In the process we found this friendly Alley Cat in Fan Tan. I spent a good chunk of teen life in this very alley. My next-door neighbor was a sculptor who shared a studio in #3 Fan Tan Alley, just to the right in this picture. Then the building was fixed up and shops were put in on the ground level and a few guys I know opened a Comic Book store, the space that I’d hang out at for hours. After they moved the store to an alley between Yates and Johnson, a friend opened a metaphysical shop in the alley. In a lot of ways I felt like I lived in the alley for about five years. I still have friends and acquaintances that work and/or live in or very near the alley, and I always enjoy visiting.